After checking the Macau Museum, we went off to check out the other sights of Macau. As we descended the Mount Fortress, one could see the beautiful Grand Lisboa Casino in the foreground. From there, we took a lovely walk along the waterfront along Cotai Island. Along the way, we also stopped the famous A-Ma temple which is the oldest temple on Macau. We stopped for lunch at this point at some local Portuguese restaurant. Was so hungry that I only got picture of what I ordered, started wolfing down and forgot to take a picture of what the husband ordered. After lunch, we continued on our way to walk off our lunch. The views were great as you can see the casinos, the waterway and the skies were clear and blue. We were reaching the casinos. Lisboa on the left, Wynn in the center and MGM grand on the right. 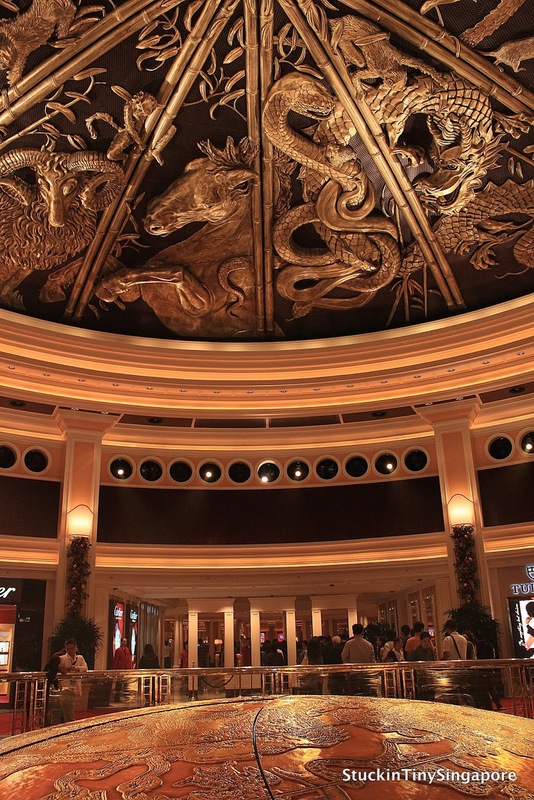 A visit to Macau isn't complete without having to visit the mega casinos that are littered all over the city. We went into Grand Lisboa to have a look. 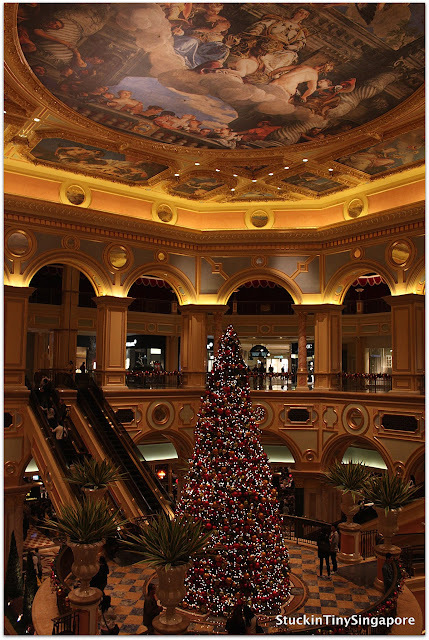 Reason being that you only have Lisboa in Macau and not in Vegas and we wanted to check it out. Furthermore, it is owned by HK/Macau's gambling king, Stanley Ho. In the lobby of the hotel, the Star of Stanley Ho is displayed. It is a 218.08 carats (43.62 g) diamond, the largest cushion shaped internally flawless D-color diamond in the world. I didn't manage to take a photo of it. But also on display in the lobby is the a bronze horse-head sculpture he bought for a record $8.8m in 2007. The horse-head sculpture belongs to a collection of 12 heads of zodiac animals which used to graced a fountain in the imperial summer place near Beijing. The heads were looted in 19th Century and only a few pieces have been found and returned to the Chinese government. Next we went to check out more casinos. There are free shuttle buses to the individual casinos from the ferry terminal. 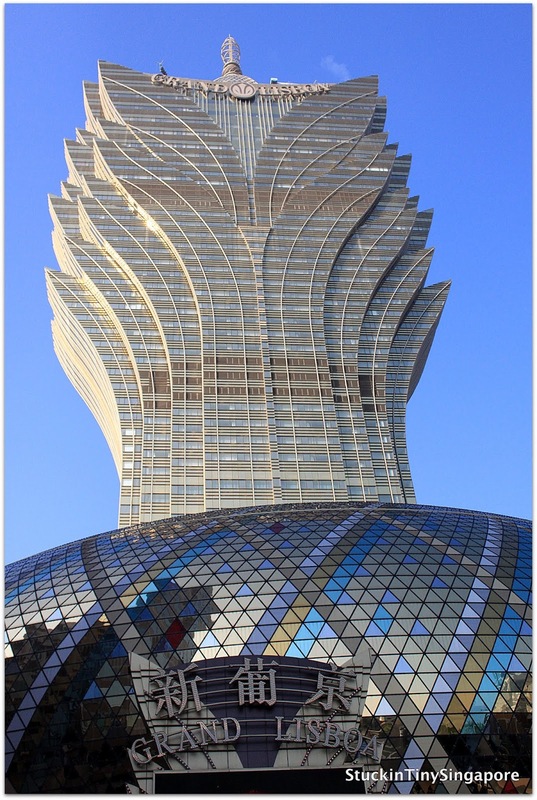 So we hopped on one that took us to the City of Dreams which consists of four towers: namely the Hard Rock Hotel, Crown Towers Hotel, and the Grand Hyatt Macau (2 towers). It is also located across from Venetian so you can just visit both casinos together. We went inside the City of Dreams to catch a glimpse of the Vquarium Show. 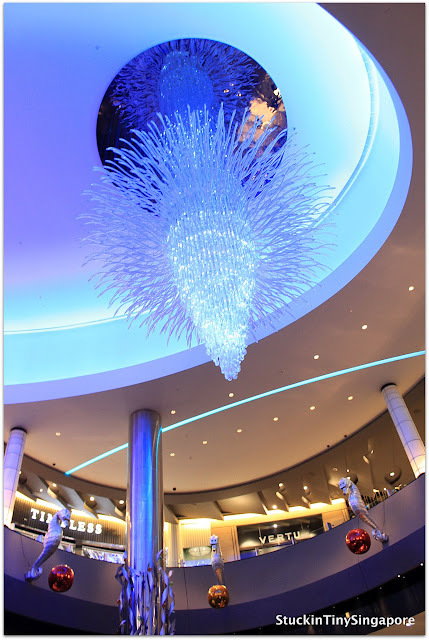 It is made of 4 video walls that shows lifelike mermaids swimming around. After that we walked across to Venetian to check it out. As we stayed at the Venetian in Vegas when we were there, we were curious whether they were similar. Even the exterior looks the same as Vegas. 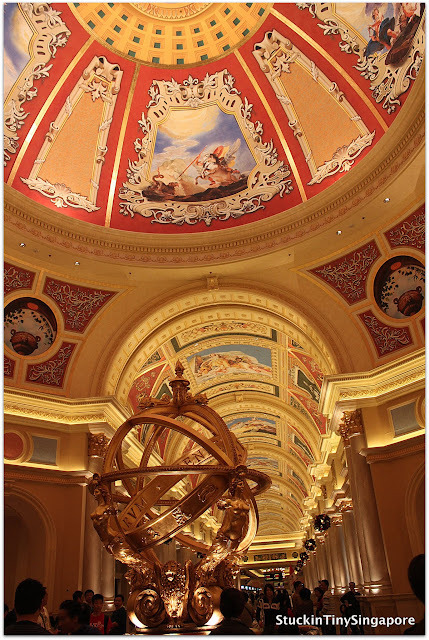 The interior is similar to the Venetian in Vegas - very grand and luxurious, but despite being so similar, Macau seems to lack a certain soul to it? Even walking outside along the casinos, both the husband and I found it lack a certain something. We definitely prefer Vegas, the atmosphere and feel of it is way better. Our final casino stop was to the MGM Grand. It has a noteworthy attraction, which is the dragon display. At certain times, the dragon will emerge from its hiding and gives a grand show. Here are some pictures of it. We headed back towards the Ferry Terminal and saw this beautiful statue and had to stop for a closer look. 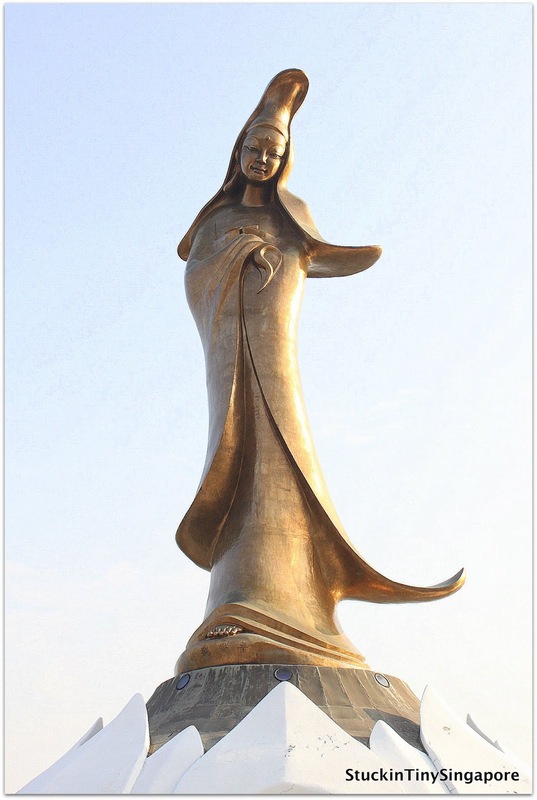 The statue is that of Goddess of Kun Iam (Goddess of Mercy) is 20 meters tall and made of special bronze. It is beautiful against the high rises in the background and the clear blue skies. We finished our day in Macau at the Fisherman's wharf, where we had an ice cream and a few pictures before boarding our ferry back to Hong Kong. We didn't explore much of Fisherman's wharf as it felt rather tacky. It was done showing various world famous sights like the Rome Colosseum, Volcanoes and such. the dragon display is not from MGM grand. it's from wynn.